So you’ve decided that you need a video baby monitor. You aren’t alone in thinking that you need one. Now you have the tough task of deciding what features you need. With the dozens of different features available at different price points, it can be a daunting task to figure out which one suits you best. One thing that you probably already know is whether you will use the video baby monitor mainly at night or also during the day. Finding a video baby monitor with good range will benefit any parents, but especially ones that have large homes or will be going in and out periodically. The whole point of a video baby monitor is to be able to keep an eye on your child even when you aren’t in the same room as them. Some of them have short ranges that are designed to only work when you are within a couple hundred feet of the main camera. Others have a lot farther range and can exceed 500-feet. A video baby monitor with a range of 500+ feet may seem like a lot, but it really isn’t as much as it sounds like. When you factor in the fact that the frequency will have to travel through walls and other structures at times, the range could be cut down considerably. If you plan on doing a little yard work while your baby naps, there’s a good chance that you’ll need a video baby monitor with the best range available. While a lot of video baby monitors will try to sell you on the fact that they have a long range, you may want to consider one that operates over Wi-Fi. Some people don’t feel secure about using a Wi-Fi operated video baby monitor for security reasons, but most manufacturers take very serious measures in order to ensure your child’s safety when you use their product. The best thing about a Wi-Fi video baby monitor is that the range is virtually unlimited. As long as the camera is on and you are in a location that you can connect to Wi-Fi, then you will be able to watch your child from anywhere. Whether you are at a coffee shop, at a friend’s house or even in another state on business, you can securely watch your child. The only bad thing about the video baby monitors with Wi-Fi is that the camera will only work if the connection works. Sometimes you won’t have a great signal strength, which could affect the transmission of the video to your device. This is not only an annoyance at times, but it can also be dangerous if your child has special needs that requires your attention at all times. If you want a video baby monitor with the best range, then you want to be able to utilize as much of that range as possible. Here is one of the top choices that offers a long range that will be reliable every time. This video baby monitor offers a range of up to 600-feet and it has an out-of-range indicator when you are approaching that limit. Many customers have stated that this distance is pretty accurate, and even is accurate when going through walls and other structures. The picture quality of this monitor doesn’t suffer when you get closer to the maximum range, like many video baby monitors do. You may find other video baby monitors that claim to have an outrageous range, but in reality, they aren’t nearly as long as they claim. 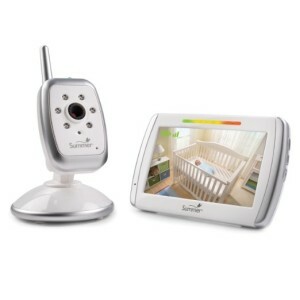 The Summer Infant Wide View Digital Color Video Baby Monitor delivers every time on its promise that the range of their product is 600-feet. Deciding whether you want to have a video baby monitor that operates with Wi-Fi is a personal decision that can be a tough one to make. There are definitely pros and cons to using one, but one of the benefits is having unlimited range. If you are worried about the security that they offer, then you can go the safe route and still find a quality video baby monitor with decent range to watch over your child. Is a Video Baby Monitor with DECT Technology Worth it? Does Radiation from Video Baby Monitors Hurt Babies?